Nico Hulkenberg from Renault was fined five positions at the 2018 Azerbaijan Grand Prix in Baku. The driver was forced to replace car's engine, for which, according to the technical regulations of Formula 1, the pilot is fined. Under the rules, one engine should be used in at least six stages. Thus, regardless of the results of the qualification, Hulkenberg will start the Grand Prix five positions behind. Lewis Hamilton and Valtteri Bottas from Mercedes, Sebastian Vettel and Kimi Raikkonen from Ferrari, Sergey Sirotkin and Lance Stroll from Williams, Daniel Ricciardo and Max Verstappen from Red Bull Racing, Esteban Ocon and Sergio Perez from Force India, Nico Hulkenberg and Carlos Sainz from Renault, Brendon Hartley and Pierre Gasly from Toro Rosso, Marcus Ericsson and Charles Leclerc from Sauber, Fernando Alonso and Stoffel Vandoorne from McLaren, and Kevin Magnussen and Romain Grosjean from Haas are competing in Baku. 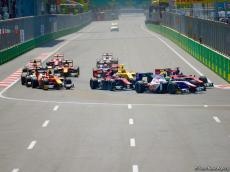 On April 29, Azerbaijan will host the Grand Prix race, as well as the second Formula 2 race. The length of the Baku track, where teams compete for the championship, each represented by two drivers, is just over six kilometers. The length of the widest part of the track is 13 meters, and the narrowest width is 7.6 meters between the turns 7 and 8, which are situated along the Icheri Sheher (Inner City). The Start and Finish lanes are located at the Azadlig Square. The Formula 1 Paddock, team garages and pit lanes are also located there.